In which I talk about small homes, lost libraries and e-readers. I went out on a limb a few years ago and bought my own home. And by bought I mean that the nice people at the bank have kindly allowed me the illusion of ownership as I slowly chip away at a substantial-for-me mortgage. It was a big deal, particularly here in Sydney. Currently, the housing market is by every account outrageously out of control. Homes are incredibly expensive, prohibitively so. For a country that seems grossly abundant in space, the reality is that our city spaces are shrinking and, challenging our nation’s psyche, apartment living is on the rise. A lot of people are not, and may never be, in a position to buy their own home. A lot of people don’t particularly want to either. But I did. It was important to me for a whole bunch of reasons, one of them being that I had watched my parents struggle financially throughout my childhood, particularly as a teenager, and looking back I know that the only reason we managed to stay somewhat rooted to our community and our sanity was the fact that my Grandma (who we lived with) owned the house outright, and had done so for a long time, my father having helped her pay off the mortgage on that place years beforehand. My parents were not burdened with an endless cycle of rent or mortgage payments while they raised their family and health and work-related obstacles made things a bit tougher than planned. I realised back then that sometimes crappy circumstances happen to good people and you need to do what you can to alleviate the crappiest of it while you can. So for me, that meant being like Grandma and buying my own place as soon as I could reasonably afford to do so. After literally years of committed saving, I was lucky enough to find an affordable (by Sydney standards) apartment the size of a shoebox only one suburb away from where I’d grown up. This is almost unthinkable in Sydney’s inner suburbs, but somehow I did it. I have made the place my home and I love it. It is small, but I know that there are people in the world (people next door!) who have much less and so I am grateful. One of the many slow realisations I have come to as a small home owner is that I’d need to slowly chip away at my beloved library just as I slowly chip away at my mortgage. There is no space for mountains of books in a one bedroom unit so a fair chunk of them have had to go. And a fair chunk more will need to leave soon too. This is no easy process for most of us ‘book people’. People who have a lot of books really like having a lot of books. In my imagination, I can easily dream up a home that is three quarters library with walls that stretch way up into the clouds, lined with endless books on beautiful timber shelves accessed by narrow mezzanine levels and ornate brass ladders. The truth is, I put in floor to (very low) ceiling shelves behind my front door and that’s as many books my unit can really handle. Space is important to life. I do not want to find myself on one of those appalling ‘hoarders’ TV shows, drowning in second hand novels and unidentifiable detritus. I have over the last three years slowly and painfully removed and relocated a number of books one at a time. Even one series at a time when I can manage it (that was a very big step). The question I’ve had to ask myself is, what do I choose to keep? Everything of course. I choose to keep everything, it’s why I have them all in the first place, damn it. So I must ask myself, what can I let go of without feeling too much remorse? I work myself up into a decluttering lather, telling myself it isn’t as hard as I think it will be and I go stand in front of my book mountains and I stare for what seems like hours and talk myself out of quite a lot of decluttering. Then I go make myself a nice cup of tea and have a sit down. I have over time given away my Harry Potters. I have given away my Charlaine Harris’. I have given away countless paperbacks. To friends, to friends’ children, to work colleagues, to the Vinnie’s charity store up the road. And yet there are still so many books, buried everywhere under everything. And so many people who all look shocked when they hear me speak of this unprecedented book cull. I can’t get rid of the Terry Pratchetts. I can’t get rid of the Jasper Ffordes. Not yet at least. This year, I did an even more unthinkable thing, for me at least. I bought a kindle. And I have to admit — I love it. It was part of the plan of dealing with the pain that comes when one slaughters their own library. I could still have ready access to all my books, and I could have more books! All without needing to sacrifice the path from my bedroom to the bathroom. I would be saved from becoming a hoarding side-show freak. I am not someone who believes a book is worth less if it comes to you via the wonder of invisible technology in the air (though it is often cheaper). An author has written those words and constructed that story and whatever form it takes, a book is a book is a book. For me, a kindle is a compromise between my love of reading and the reality of life in an expensive city where time and space are at a premium. I love the texture and feel of a book, I love the texture and feel of a library, but if I’m to read (and live) at all, I need the space and the time to do it. But — I still buy proper books. I do so without thinking. I did it just yesterday. It’s an old habit and we all know the saying. I also know that a kindle is only good for novels. It won’t ever replace the joy and beauty of a big art book or photography collection, a wonderfully illustrated children’s story or colourful craft how-to guide. Those books certainly won’t be decluttered. It’d be like removing the foundations of a skyscraper and expecting the rest of it to stay upright in a gentle breeze. Devastating. And so I continue to chip away, one book at a time, hoping to balance the scales between a small beloved home and a large beloved library. Sydney, I love you. But I love my books too. Sigh. One good thing, among many good things, about having a composting toilet (stay with me here), is that I now have a floor to almost ceiling bookcase that is in a perfect location and takes up an otherwise useless wall. I too have a kindle and I probably should cull, but maybe all I really need to do is to be even more inventive about where to locate my books! Good thought proviking story, well written. Thanks Wendy. 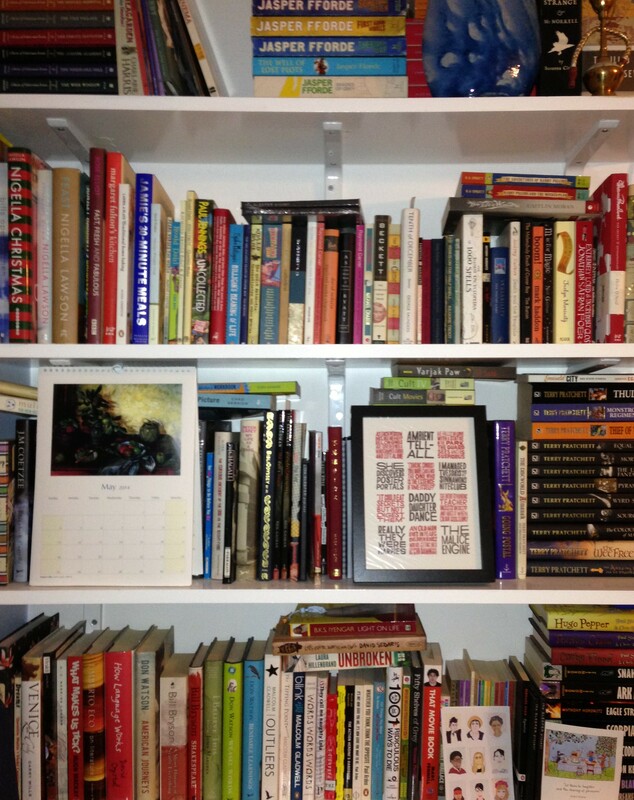 Pingback: View From The Top (of the Book Pile) #1 | like stories? we should talk.